Shortly after arriving in town, we went looking for some Coffs Harbour shopping at Park Beach Plaza on the corner of Park Beach Road and the Pacific Highway. The centre was hectic as Saturday mornings tend to be, but we still managed a chat with a friendly checkout operator. 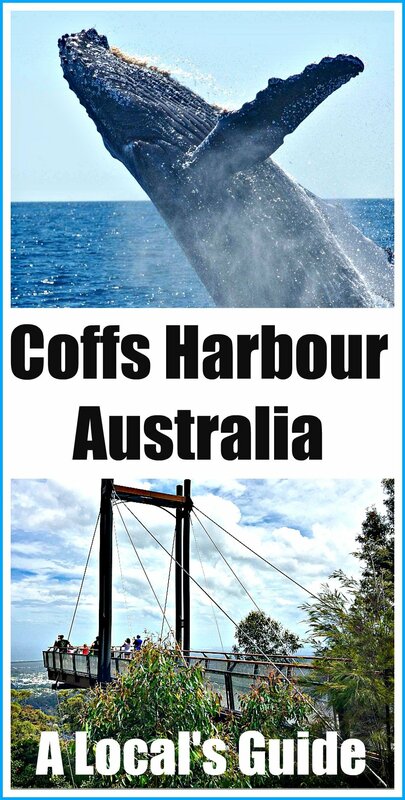 Before I knew it, I’d asked for and received, her local’s guide to Coffs Harbour Attractions. In retrospect they were exactly what we were looking for. The Park Beach Hotel Motel – aka the Hoey Moey – it’s on their sign! 2. 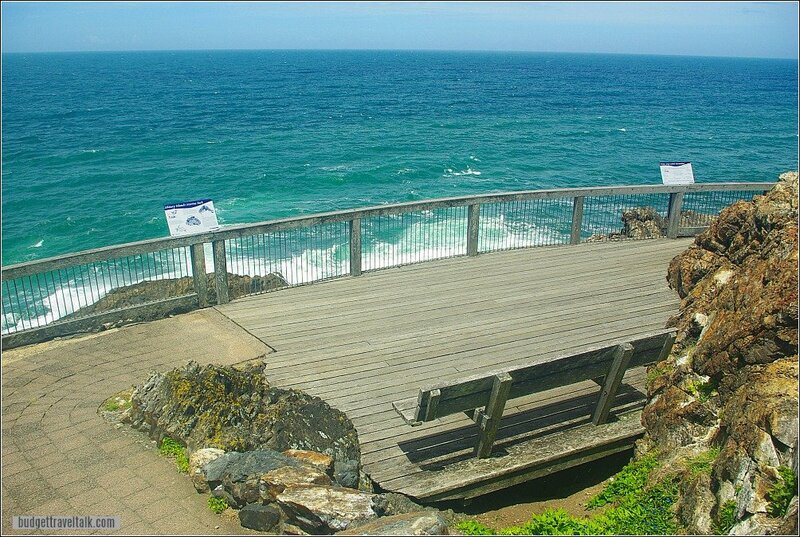 Visit a Coffs Harbour Beach. Looking for a Coffs Harbour Caravan Park? 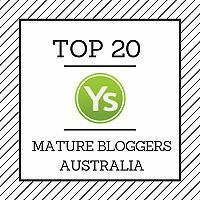 Thanks for reading and commenting – we really appreciate it. It was close to lunch time so her first suggestion was lunch at the Coffs Hotel known as the Hoey Moey. The Hoey What? A local institution, the Hoey Moey is famous for it’s budget counter meals. There is a Special for each day of the week and at $7.50 for members and $12.50 for non-members they are definitely a bargain. We arrived five minutes after leaving the shopping centre, grabbed a coldie, ordered lunch and were served and out of there in no time at all. Saturday’s meal was a delightfully fresh Crumbed Lamb Cutlets with Chips and Salad. The lounge area had a tropical feel with bifold windows on two sides, letting the outside in. At 90 Ocean Parade, the Hoey Moey, with it’s backpackers accommodation, is just down the road from the first of our Local’s recommendations for Coffs Harbour Attractions. 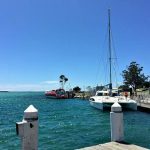 A Marina walk-through admiring the boats was first on our agenda, followed by Muttonbird Island, a wedge-tailed Shearwater nesting site. We love Marinas and wildlife so were eager to get started and luckily snagged a spot in the Marina carpark. Whale Watching tours (June to November), Scuba Diving and Deep-Sea fishing charters leave from the Marina and the shops range from Ice-Creameries to Ship’s supplies. Try the fish and chips from the Fishermen’s Co-op in the Marina. The island resembles a raised headland connected to shore via the breakwater which also serves as a walkway. At the entry point to the island and at various other places on the uphill walk, information boards appear with interesting facts. Muttonbirds. The correct name for these birds is Wedge-Tailed Shearwaters, named because their sickle shaped wings shear through the water. The birds were eaten by Aboriginals, but the Muttonbird tag came from early white Australians who thought the meat tasted like mutton. The grassy hill is completely riddled with nesting burrows and peeking into them might reveal an egg (they only lay one each year), parent or chic, or nothing depending on the season. August – The birds arrive from South-East Asia in August. Mid-November – Mating begins and eggs are laid in the freshly repaired burrows. Mid-April – the very fat chick is left behind and the parents depart. Early May – the chicks follow their parents. The highest point of the Island has 360 degree views from Marina to Ocean and Mountains to Solitary Islands and is a great place for viewing the annual humpback whale migration (May to November). A Muttonbirds by Moonlight tour is operated by an Aboriginal ranger and Marine Park specialist in February and March. It’s worth giving them a call on (02) 6652 0900 to hear about the tours they run generally in the Coffs Harbour/Dorrigo area. This 500m paved walkway leads across the island to an ocean viewpoint. It sure was windy! Viewing platform on the ocean side of Muttonbird Island. An authentic old timber jetty if ever there was one, this old girl has lights enough for a night time of fishing or a romantic stroll. Jetty Beach running at right angles below is a top place to set up a tripod to catch your very own Jetty Sunrise. Wear your bathers and dive bomb with the locals. 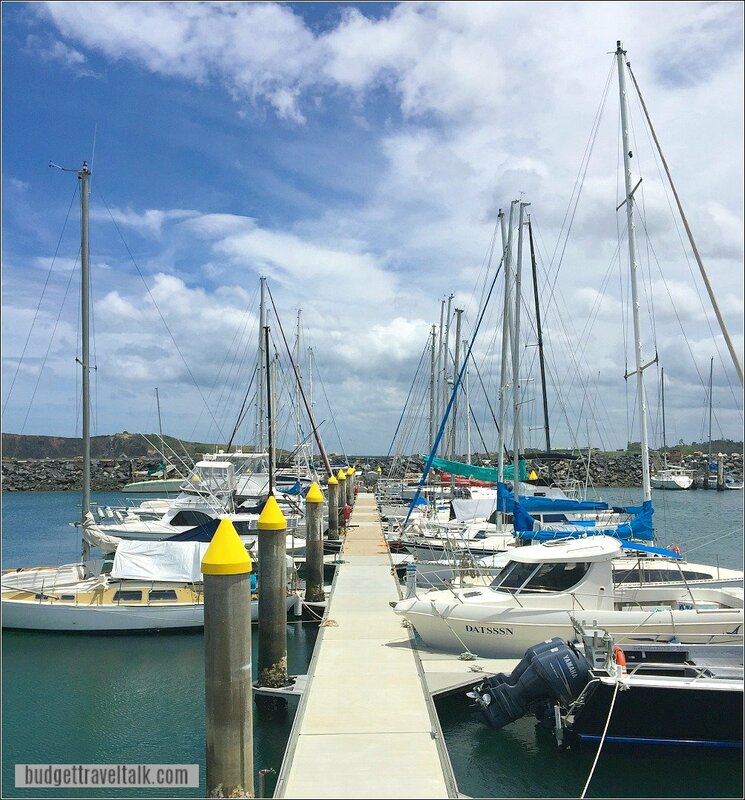 The Coffs Harbour Marina, Jetty and Muttonbird Island package is possibly the best known of the Coffs Harbour Attractions. All three can be visited in a 4.2km walk, taking about 50 minutes to complete. Some of the best attractions around Coffs Harbour are beaches. We sampled Moonee and Emerald beaches to the north and Sawtell to the south, but I’m sure all Coffs Harbour beaches are of a high standard. 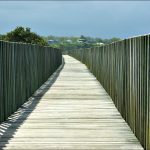 The boardwalk at Urunga, further south from Sawtell is an amazing spectacle in itself and the dunes, pristine. The Urunga boardwalk is covered in this separate photographic post. 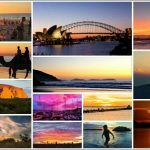 The beaches in and around Coffs Harbour are impressive and it’s easy to see why Coffs is a major player in the New South Wales holiday scene. Don’t worry that the beaches will be crowded though – far from it. 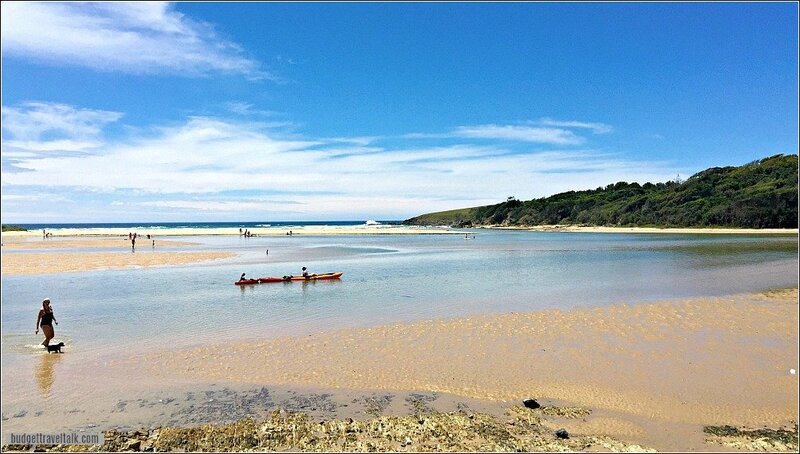 Read on to find my favourite Coffs Harbour beach escape. Famous for the huge fig trees that shade the boutiques and outdoor cafes of the First Ave shopping district, Sawtell was peaceful on Saturday afternoon. Even so, there were several cafes open, and many more promising happy hours from 4pm. We did venture to the Surf Club and beach, but the weather was too wild and windy to be inviting. Don’t you just hate that! Wild and Windy but what a gorgeous New South Wales beach! With coffee on our minds I approached yet another local who after some thought directed us to Split Cafe and Espresso Bar. A pleasant surprise at Split Cafe, is the wait staff take table orders – even better is the great coffee and baked goods that are cooked on site. Quirkily they also sell Cycle accessories, gift lines and organise group bike rides. I love the way Aussie coffee shops have diversified – is it a world wide thing? 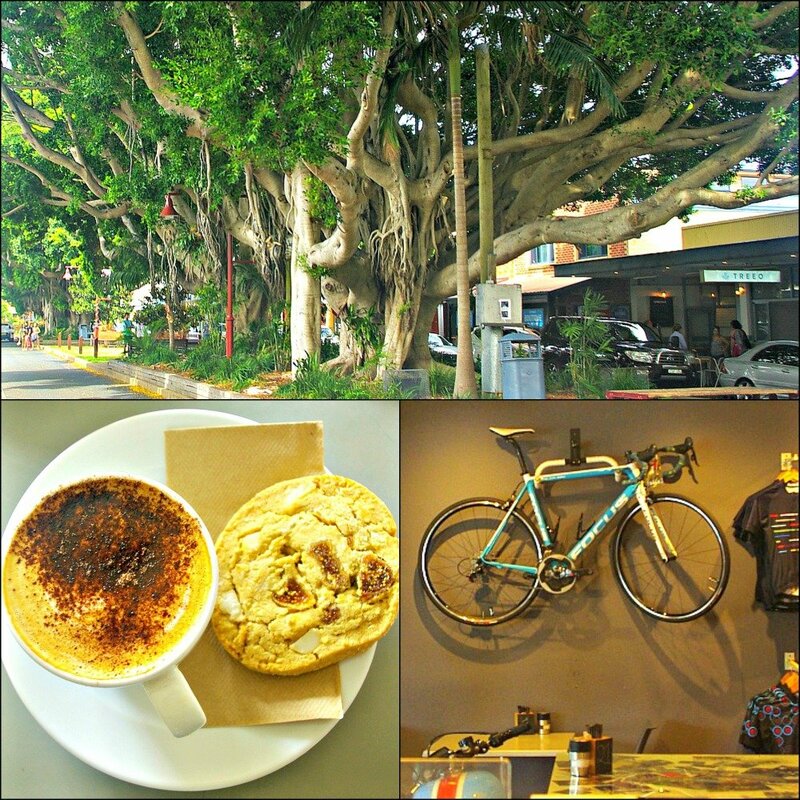 The shady main street of Sawtell with it’s atmospheric fig trees and Split Cafe. With the beach off-limits for us, it was time to investigate somewhere with protection from the prevailing winds. We found it at the local fishing, swimming and SUP spot located inside the mouth of Bonville Creek. Directly south again from here is Bongil Bongil National Park, known for fishing, beaches, rainforest walks and canoeing – and it has picnic areas and BBQ’s. Protected waters of Bonville Creek at Sawtell south of Coffs Harbour. The Reserve, where creek meets beach, has a lot going for it. On the week-end families arrive and set up for the day. At low tide sand bars appear mid-stream and riverside beaches grow in size and popularity. Canoes, SUP, inflatables, swimmers, walkers and fishermen are catered for. Moonee Beach caters for them all without seeming crowded and is my pick for the best Coffs Harbour beach escape. The caravan park on the inlet looked appealing, it had a well-cared for look about it and had tennis courts. We would definitely have stayed there if we had time. (read more about Reflections Moonee Beach Caravan park in the Coffs Harbour Caravan Park section below. Moonee Nature Walk is a 4 hour return walk starting and finishing including a wade across the estuary – especially pretty with wildflowers in spring. 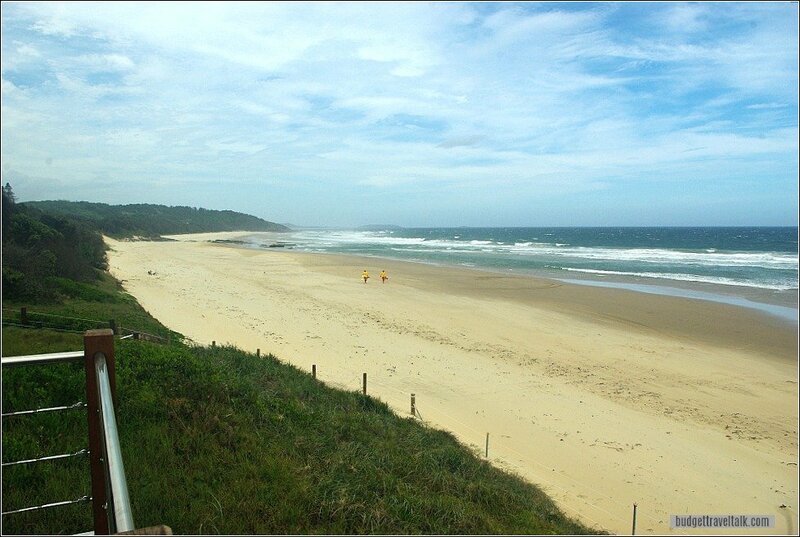 The walk features beach-side rainforest, birdlife and a beach/dune walks. New South Wales National Parks and Wildlife service run Paddle our Parks. The next Moonee Creek paddle is 3/2/2018 9 am till 12 noon. Check the website for details. Facilities include a take-away shop, BBQ’s, headland boardwalk, bush walks, shady trees and picnic shelters with a Caravan Park in prime position for longer stays. The water at Emerald Beach has a definite Emerald tinge to it! 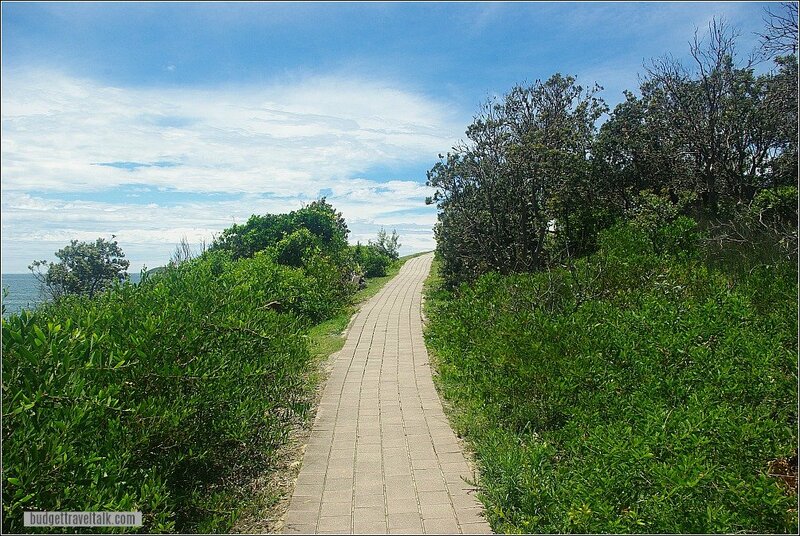 Follow the walking track from the Emerald Beach carpark toward Look At Me Headland (part of Moonee Beach Reserve). 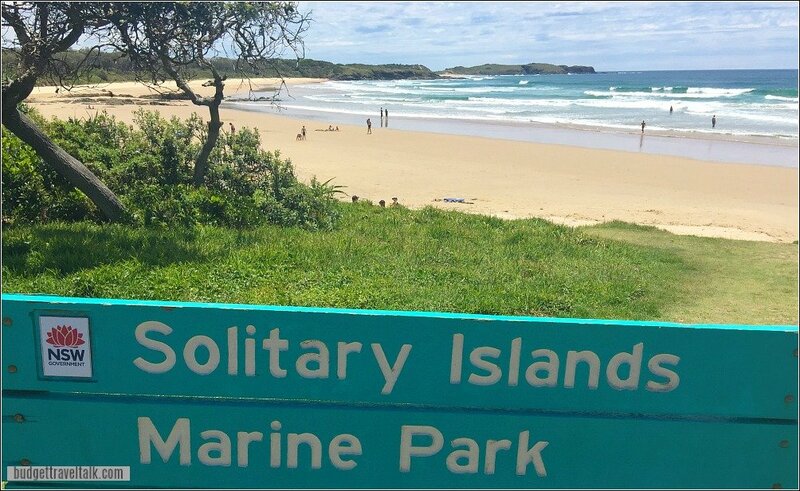 The views to Moonee Beach, Coffs Harbour and Muttonbird Island are superb. This beach community has a handy selection of coffee shops, cafes, restaurants and amenities. Look at me Now Headland and Serenity Beach from Emerald Beach headland. In the background is Coffs Harbour. Follow the Pacific Highway 15 minutes north of the CBD passing the Big Banana attraction on the left. Shortly after, turn left into Bruxner Park Road and again into Scenic Drive, arriving at the Forest Sky Pier. The pier juts 21 metres out over the forest floor 15 metres below. 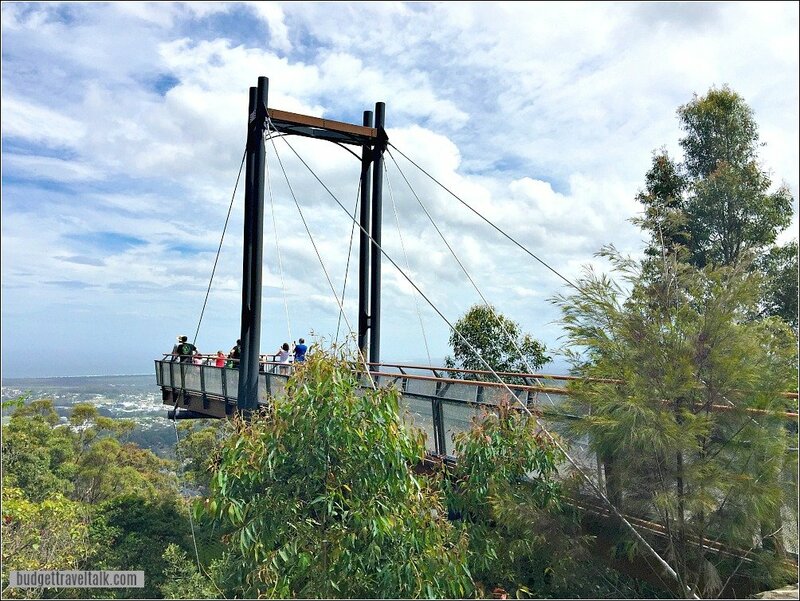 We were very impressed with this and similar lookouts we discovered on our New South Wales road trip. The view of Coffs Harbour and Coastline. Coffs Harbour is well-known for it’s beautiful beaches, but it would he a mistake to ignore it’s hinterland. Only 30 minutes from Coffs Airport, Bellingen is my kind of place. On the banks of the Bellinger River where jumping kids have fun dive bombing the reflections, it’s well-preserved architecture hides an eclectic mix of bars and restaurants that kept us coming back again and again. If and when you manage to escape the charms of Bellingen, the Dorrigo rainforest further inland awaits. Bridge at Crystal Shower Falls in Dorrigo National Park. 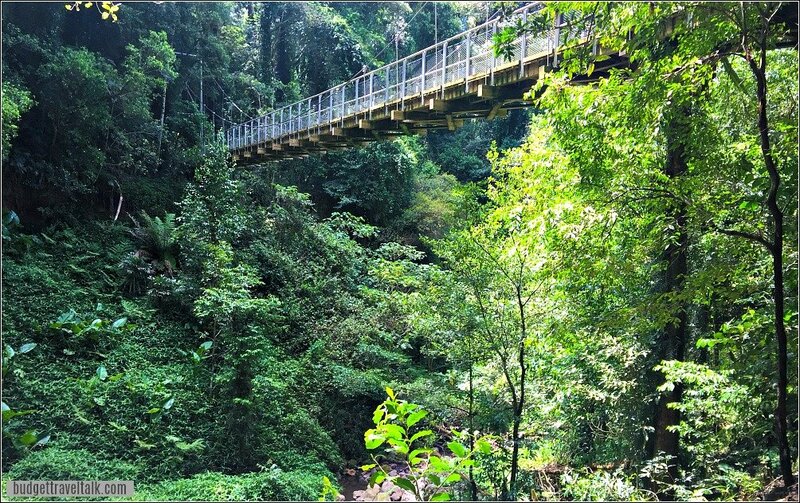 Allow at least one full day (three is better) to explore the Coffs Harbour hinterland town of Bellingen and the Dorrigo National Park Rainforest. 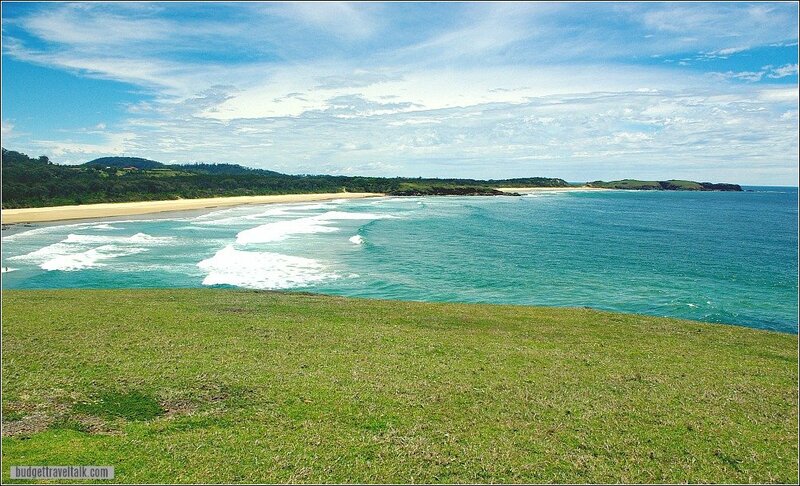 This 60 km walk takes in 30 beaches extending from the fishing/tourist towns of Red Rock and Corindi Beach in the north to Bonville Headland at Sawtell in the South. The way is marked by 200 Lighthouse markers with the whole walk taking 4 days. Alternatively pick and choose different sections to walk. Read more here. 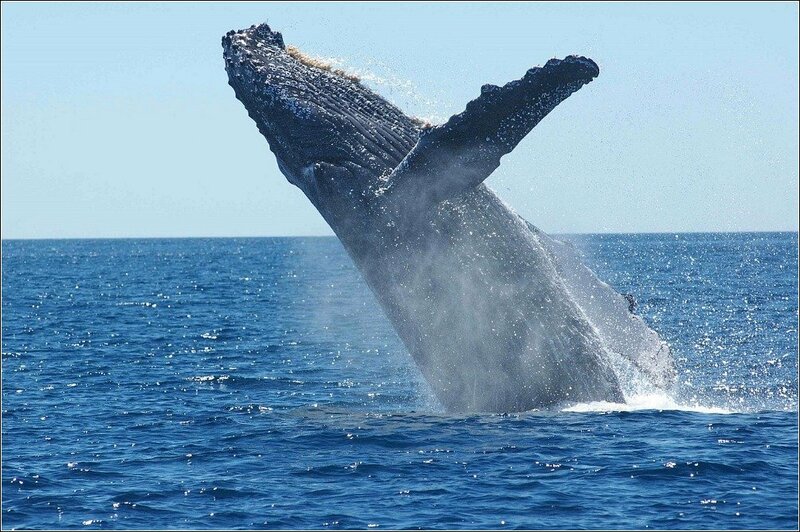 Read about whale watching on the Gold Coast of Queensland. As this was the start of our Coffs Harbour to Brisbane road trip, we were towing our Coromal van. A friend recommended we stay at the hinterland town of Bellingen where the Showgrounds is the only place to camp. Our Wikicamps App provided us with reviews and contact information, so we rang the number first to establish availability. We recommend Bellingen Showgrounds as a great place to stay when visiting Coffs Harbour. It has security coded clean amenities, grassed sites, is within walking distance of Bellingen’s main street and is a beautiful country drive away from Coffs Harbour. The three Bellingen/Coffs Harbour routes available range in duration from 29 to 40 minutes. 39 Hammond Street Bellingen. Phone 0431 264 836. 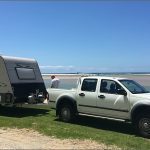 For those looking for Coffs Harbour camping and/or caravan sites within walking distance of the CBD, this park fits the bill. The 45 minute walk through the Botanical Gardens to the beach is an added bonus. Those searching for Pet Friendly accommodation Coffs Harbour will be happy to note that all sites and some cabins at this park are Dog Friendly. 123 Pacific Highway. Phone (02) 6652 1694. 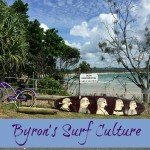 Wanting to stay at a Coffs Harbour Beach? 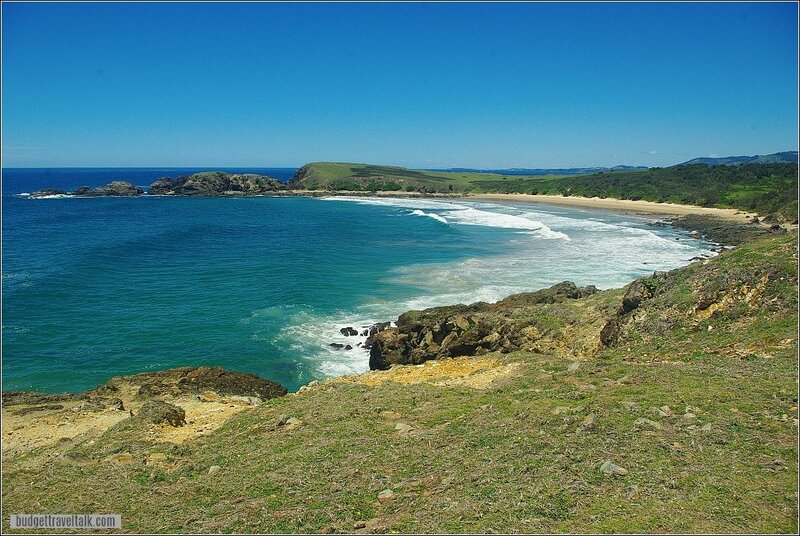 Moonee Beach is a fantastic destination (see above) only 16 minutes or 14 km from Coffs Harbour CBD. This is another Reflections Caravan Park with the same Dog Friendly sites and cabins. As well as warm dog baths there is a dedicated washing machine for dog bedding. 50 Moonee Beach Road. Phone 02 6653 6552. Note: We are not affiliated with Reflections in any way. Although we have stayed and paid at quite a few of their parks (and enjoyably so), we have not at either of these locations. Reflections is the only caravan park at Moonee Beach, but there are more parks to select from in Coffs Harbour. Read more about Australia here. 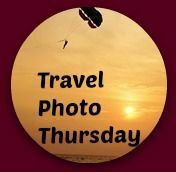 If you have a blog, please add a travel post containing a travel photo (because we all love them) to the link below for Nancie’s Travel Photo Thursday which we co-host with Ruth from Tanama Tales and Rachel from Rachel’s Rumination. Gosh I don’t know what I would do without my Holiday memories. They keep me entertained whenever I’m feeling bored or lonely. This place looks incredible! To me, locals give the best advice. There are so many beaches to visit around this town. I love to beach hop, walk around and take pictures. The sky is fantastic. The name is so original! We have been to Coffs a number of times as we had family that used to live there but haven’t ventured into the Hinterland. Will most definitely have to do that next time. Bellingen is my favourite country town! The Dorrigo rainforest is very good and I’m from North Queensland which is full of rainforest! We’ve spent a lot of days camping around the Coffs Coast area. 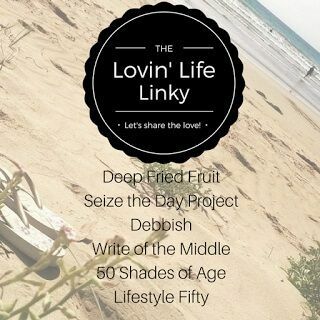 I absolutely adore Sawtell and have stayed at Red Rock, Corindi Beach and Urunga in our caravan. These are all great camping spots. 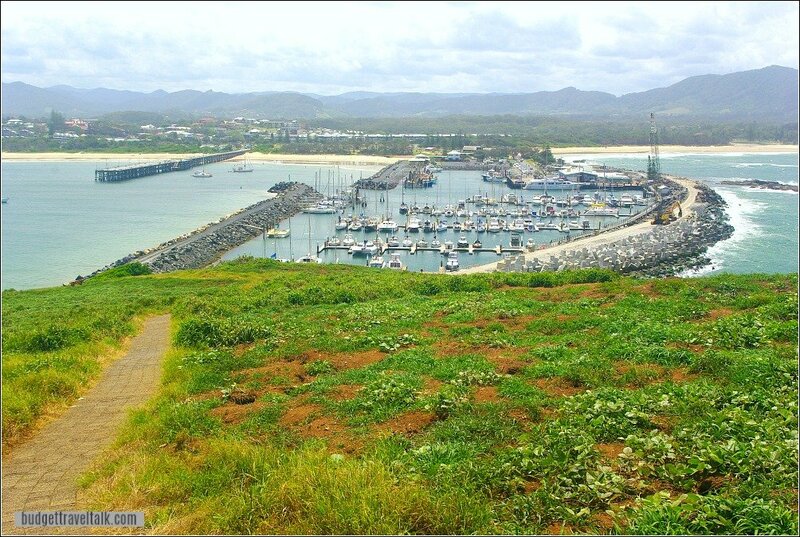 The view from Woolgoolga headland is also a must see. You have provided me with some great ideas for things to do in this region that I never knew existed. Thank you. It looks like there is quite a bit to do there. And how about that gorgeous green water at Emerald Beach? Great ideas if I ever make it there. Thanks Jill. There is more to do that we didn’t get around to so we will be back there again – hopefully soon. Gorgeous area, Jan. I’m jealous of all that sand and sun, while I’m basking in the snow and ice (haha). Coffee shops are evolving everywhere I think. Our local shop in wee AR has a local vibe with local artwork for sale on the walls. I’m always wondering what’s going to be on the walls the next time I go in. We tend to blow straight through Coffs but on a couple of occasions we have spent a little more time there we have had some good food including great fish and chips. But you do need to look under the covers so asking a local is a great idea. I don’t think I made it to Coffs Harbour on my trip around Australia – will have to add it to the list for next time and hope to see whales! Yes Laurence. Just check the whales season. You can see them on their way north from Antartica and then with their calves on the way back again. It’s a lovely area. Great beaches and I love Bellingen (my current favourite country town) and the Dorrigo rainforest. Looks like a lovely place to spend the afternoon and you give lots of ways to do so. Good place to have in your backyard – especially with a lovely harbor and beach! Beautiful photos! I lived in maui for a few years and always regretted not making a trip to Austraila when we were already about halfway! I hope to make it there one day. Yes that would have been good if you had done it from the half-way point. I’m sure you will get here one day though. What a comprehensive guide to the area! 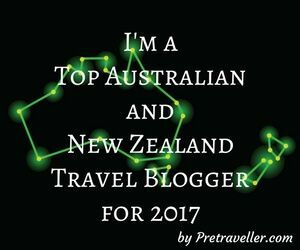 Granted I’ve only been to Australia twice—and each a quick eight-day trip—but I’ve never even heard of this region until this post! Hi Kristin, It is a great area to visit. Bellingen is my favourite country town!